I am helping a client work through some performance problems and thought I might share a view with you. The data was collected for 57 seconds during a production run. 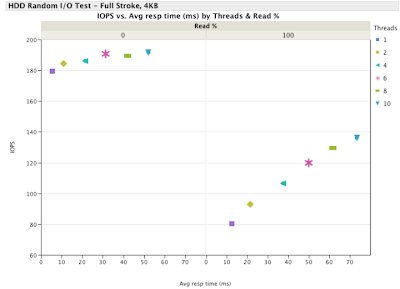 The problem we are chasing is the usual performance problem: latency. In some cases the latency is close to 100ms, which would make everyone except a floppy disk user unhappy. The view of the data is intended to shed some light on where problems might exist that we need to further explore. Using summary data from tools like iostat, vmstat, mpstat, prstat, or top won't show you anything like this. 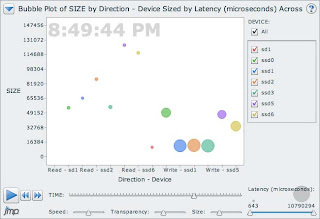 In the bubble chart, the Y axis is the size of the I/Os. Along the X axis, reads are on the left and writes are on the right. The size of the bubbles is the latency in microseconds. Big bubbles mean big performance problems. Press the play button to see the changes over time. If you would like to see this sort of analysis for your system, contact me and we can discuss an engagement.